The Art Deco city of Napier sits on the eastern shore of the North Island and is home to a great beach, shopping, restaurants, nightlife, museums, and more. The hostels here cater to a variety types of travelers from backpackers to groups to families, so make sure that you read the descriptions and the reviews. Some are quiet, some are party-oriented, some are new and modern, and some are older and charming. Below, we've listed some of the best to make your search easy. And they are all right next to, or very close to, the beach. 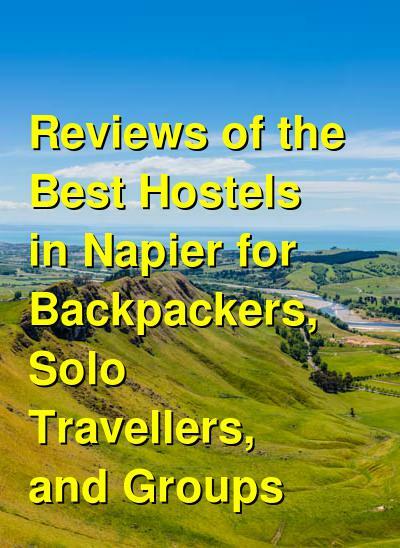 How much do hostels in Napier cost? The colorful and fun Art House, located on the beach and surrounded by restaurants and shops, is a comfortable and social hostel offering good amenities at affordable prices. Their outdoor patio area is a nice spot to relax and mingle with other guests, while their common room with TV and Xbox is a comfortable place to relax. The shared kitchen is basic and clean, and offers everything you would need to provide your own meals. The overall decorations are nice: each room offers interesting artwork and an eclectic style to the entire establishment. They offer free Wi-Fi, bike rental, tour booking, luggage storage, and more. Guest reviews highlight the friendly and talkative nature of the staff, which can provide advice about the city and beyond during our stay. The cleanliness of the facilities are also noted and praised, as is the great location and comfort of the beds. Just next to the beach is this gem of a hostel with a lot to offer. The location is great, and nearby are shops, restaurants, and more. The entire place resembles old stables that have been refurbished into some very clean and modern rooms with nicely decorated walls. Check out the photos! The dorms are comfortable, cozy, and quiet, and the bathrooms are clean and modern. The shared kitchen is fully stocked and the outdoor courtyard area provides a nice spot to mix and mingle with your fellow guests. They offer lockers, laundry, free Wi-Fi, good security, free parking, and more. They have received high marks from guests for the super-friendly staff, cleanliness, and great heaters in the winter (which many other hostels are lacking). This one is definitely worth looking at! What was once a luxury hotel is now an "upscale" backpackers hostel. This refurbished and beautiful art deco building is located just a few blocks from the shore and close to bars, restaurants, and shops in central Napier. Offering dorms (with an all-female option) plus private rooms in a variety of sizes, with and without ensuite bathrooms, this hostel offers something for everyone, and at affordable prices, too. The staff takes pride in the establishment and in their work, and it shows. They are always on hand to help out and make your stay fun and enjoyable. Guest reviews affirm this, as most say that the staff is friendly and helpful. The communal kitchen is large and fully-stocked, and the common room is relaxed and comfortable, plus it has a pool table. They also offer free breakfast, Wi-Fi, laundry, and more. On the beach, close to shops, bars, restaurants, and the National Aquarium, the YHA Napier is a hostel that was formerly a hotel. On offer are a variety of room types from dorms to private rooms, with and without ensuite bathrooms, all at affordable prices. Guests who have stayed at a YHA establishment in other locations should probably know what to expect: clean and modern facilities and a friendly, helpful staff. They have a large communal kitchen, common room with a TV, an outdoor patio area, bike rentals, Wi-Fi and internet, tour and travel advice, and more.